It is amazing how hard some people will work to convince others that doing what is absolutely necessary is impossible. Imagine if most people chose to believe that it is too late to do anything about climate change. Even if they were right, doing nothing due to widespread acceptance of the idea would amount to humanity turning its back on its children, dooming them to live through the collapse of human civilization. As another example, the biggest obstacle to global peace is arguably the widespread acceptance of the self-fulfilling prophecy that war is inevitable. What if it became commonly understood that war is always a choice and they only benefit the corporations of the military-industrial complex that essentially dictates foreign policy to decision-makers in Washington? It is possible that war would become unthinkable, if we are willing to make that happen. Global climate change and global peace, like nearly every issue that Congress and the White House have failed to address, are problems for all but the few who pay for the elections of our representatives in Washington. Congress and the White House routinely put the immediate interests of corporations over those of the rest of us. The short-sighted approach of the Wall Street criminals who dominate the government is setting the US and global economies up for a fall that will make 2008 look like a mild downturn. The economic devastation would leave us woefully unprepared to deal with the human crisis that would result. Well-respected experts like Helen Brown are warning us to prepare for a state of permanent martial law in the wake of the coming economic collapse. The problem then is that until we change the US system of campaign finance, there is little hope for human civilization. There is a large and growing movement to do so through the only means that a corrupt Supreme Court has left us, a constitutional amendment. You would think that the recent 54-42 vote in the Senate would have caused naysayers some pause, but that does not seem to be the case. 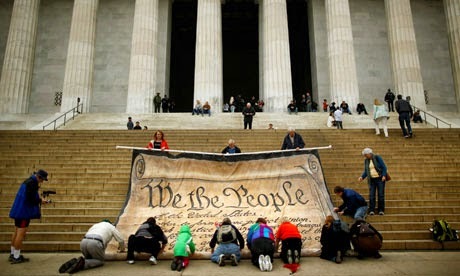 A recent article in Alternet made the claim that this meant the movement “collapsed with a predictable thud,” overlooking the fact that the vote itself was a historic milestone on the path to the inevitable enactment of an amendment that will be the first giant step toward establishing democracy in the US since the constitution itself. What casual observers of the amendment movement consistently fail to recognize is that there is a specific path to passage that should be obvious to anyone who thinks through the problem of getting a corrupt Congress to pass an amendment that will undercut the very system that got most of its members into office. Any solution will clearly need to involve making support for an amendment a crucial campaign issue in Congressional elections. If voters can be made to use this issue as a litmus test for their support, we can and will elect a Congress that will pass an amendment. Such a Congress will have proven that it is willing to put the interests of its constituents over those of the corporate patrons of the current occupants of Congress. Then, they can get on to dealing with other aspects of corruption that critics of the amendment complain it would not address. Movement leaders can take much of the blame for the failure of recognition of this clear path to victory. The idea has been floating around since before Citizens United was decided, as the Roberts Court’s call for briefs that would expand the original question to gut campaign finance reform made it obvious which way it was going to come down. After the decision, some of us immediately got to work promoting not just wider awareness of the problem, but recognition of the solution. Unfortunately, early supporters gave up on the strategy after the 2010 election failed to yield results. This was surprising, given that the lack of success in electing candidates pledged to support an amendment was predictable. Not only was the idea new, but organizers failed to achieve buy-in from many groups working on the issue. Move to Amend, which had the most boots on the ground early in the battle, rejected the idea outright and refused to work with any group that did not support the amendment they wrote or their strategy to see it passed. In 2010, Public Citizen issued a call for pledges to support an amendment that would overrule Citizens United. I was one of dozens of candidates for the House and Senate who answered the call. We will never know how many more candidates might have been willing to take the pledge had it received wider publicity through other groups working on the issue and the “alternative” media that treated it as just one issue among many rather than the central problem halting progress on addressing the rest. People for the American Way was Public Citizens’ only partner. Its role was confined to mentioning the campaign on its website and listing candidates who had made a pledge. Despite an effort to revive interest in the idea in 2012 and the ease with which pledges were obtained, another four years passed before the idea finally began to catch on. In 2012, both Public Citizen and People for the American Way declined to continue what came to be most widely known as the Pledge to Amend campaign, despite the obvious fact that it was a strategy that could only succeed over several election cycles. The same was true for other groups that were approached. Most of them did not seem to appreciate the significance of the idea. Although Pledge to Amend is the name of the same strategy recently adopted by Move to Amend, its steering committee explicitly rejected the idea in 2012 as premature whenever the question came up. Move to Amend is now calling for people to solicit pledges of support for an amendment that would reform campaign finance and abolish corporate constitutional rights (corporate personhood), but there is little evidence that their local affiliates around the country have responded. As a result, it appears that another election cycle is likely to be wasted. The earliest serious effort to organize a movement around the idea of making support for an amendment a campaign issue seems to have started in Oregon in 2014. In 2013, various groups around the state came together in a successful effort to get an amendment resolution passed in the state legislature. By 2014, they were looking for another project. At that time, the national steering committee of Move to Amend had failed to provide strong leadership in giving local affiliates around the country a new objective once those who had worked passed amendments in their communities had succeeded. They suggested working on getting pledges from state legislators, seemingly ignoring the fact that the amendment had to pass Congress first. The Oregon Democracy Coalition decided to pursue what they call the Ask the Candidate strategy, first suggested by Public Citizen in 2010. The effort is off to a slow start, but is likely to serve as a model for groups around the US by the time of the 2016 election. It is based on the idea of forming local groups in every community and empowering them to raise awareness of the issue of corruption and the way to address it in ways of their own choosing. The coalition has quickly grown from its original six members (considering all of the Move to Amend locals in the state as one group) to 29. It is reaching out to public interest organizations in the environmental, peace, economic justice, labor and other movements that have largely been working in isolation. All of these groups are realizing that their efforts will be fruitless until we have a government that puts our interests over the corporate patrons of our so-called representatives. While there have been dozens of other strategies proposed that merit support, none have the momentum of the movement to amend the constitution. As the alternative media and activists nationwide increasingly become aware of the central role of reforming campaign finance in moving America forward, the model used by the Oregon Democracy Coalition is likely to become the nucleus of a truly grassroots movement for an amendment in communities around the country. It might even just become the way that we finally build the fabled “progressive movement” that cynics have written off as impossible to achieve. The CIA has been using propaganda to control public perception of covert operations overseas since at least the early 50s, when it was officially given this role under Operation Mockingbird. Although this authority was given only with regard to manipulating foreign media, it quickly morphed into a means ofcontrolling US public opinion about the imperialist actions of its government. Failure to understand this is one of the main reasons that the American public has no idea what the government is actually doing in its name in other countries. Understanding how those who determine US foreign policies use conspiracy theories to control conversation about US policies abroad is crucial to understanding how to challenge their propaganda. American imperialism beyond its present borders had its modest beginnings in the Spanish-American War. This was a war heavily promoted by much of the corporate media of the time, following the lead of William Randolph Hearst. The conspiracy theory of the time was that the USS Maine was sunk in Havana harbor by a Spanish mine, a lie that was repeated enough that it came to be regarded as a matter of common knowledge. This led to an initially reluctant McKinley to embrace imperialism. The story of the rise of American influence from then is one of imperialist expansion to serve the interests of international corporations. As the US grew into the most powerful military, economic and diplomatic power in world history, it eventually gave up trying to justify its aggression on the basis of false claims that it was defending itself from direct attacks. At the end of WWII, the US adopted a new policy of making war against anyone it perceived as a possible enemy. Based on the assertion that the national interest included waging war anywhere where communism tried to take hold, Truman chose to go to war with Korea. As importantly, he did not seek Congressional approval to launch the assault. The US-controlled UN endorsed the Korean War despite the fact that it was not defensive nor intended to stop genocide, the only two exceptions to laws stating that national sovereignty is inviolable, This is a doctrine going back centuries to the Treaty of Westphalia after the 30 Years War. It served as a founding principle of the UN charter. Since then, any offensive war against a sovereign nation is against the law. However, under policies based on the notion of American exceptionalism, violation of national sovereignty is no longer considered by the US government as an impediment to involving itself in civil wars or starting wars of choice. The UN has become irrelevant except for the cover it provides NATO and its allies, especially Israel. The Korean War was immensely unpopular, especially after it resulted in what millions of Americans considered the country’s first defeat. Although the USSR, China and communism itself were regarded by most as real threats to US security, the nation was tired of war. During the Eisenhower administration foreign intervention was mostly covert, with the CIA providing cover under policies established by Operation Mockingbird. In his final days in office, Eisenhower warned Americans about the threats posed by the growing power and economic influence of the military-industrial complex. According to James Douglass, author of JFK and the Unspeakable, the MIC was referred to as the military-industrial-government complex in the first draft of his speech. The original term was much more descriptive of the power that these corporations had come to wield over the American government, but perhaps he felt that Americans were not ready for the truth. At any rate, he was no longer in a position to do anything about the threat. Douglass makes a compelling argument that it was Kennedy’s efforts to change America’s imperialist policies that led to his murder by what he calls “the national security state.” Kennedy was shot five months after declaring his intention to end the Cold War. This was after declaring a unilateral ban on atmospheric nuclear testing leading to a partial nuclear test ban treaty with the USSR, secretly opening discussions with Kruschev, beginning to establish a backdoor dialogue with Castro and signing three orders to develop a plan to withdraw from Vietnam beginning in 1963. Many Americans have forgotten that it was Johnson who used the manufactured incident in the Gulf of Tonkin to escalate a war that Kennedy tried to end. A mere 10 years after the end of the Korean War, American empire builders used this ruse to gain public support for a war of corporate imperialist expansion. The failure of Americans to accept the fact that they are routinely lied to by leaders of both parties has had disastrous consequences. In the aftermath of the JFK murder, there was a widespread belief that he was the victim of a conspiracy that the government was covering up. This led to a little-known CIA program to discredit critics of the Warren Commission report as “conspiracy theorists”while simultaneously conducting a campaign to erase from the American consciousness any awareness of everything Kennedy had done to challenge the military-industrial-government complex. The program was and continues to be a success, with the public growing increasingly skeptical of any alternative theory of JFK’s murder, despite the fact that the House Select Committee on Assassinations declared in 1977 that he was murdered as the result of a "probable conspiracy" that Congress has yet to seriously investigate..
With few exceptions, the resistance to traditional power structures in the US that escalated in the wake of the assassinations of the Kennedys, Martin Luther King and Malcolm X has dissipated. The influence of the Vietnam antiwar movement is often overstated. The war continued until it became politically expedient to end it. The growing opposition to the war after 10 years and tens of thousands of American dead was only one consideration. What the movement did show is that Americans are capable of standing together against the government when it becomes oppressive. Occupy tried to recreate this but failed because itwas so worried about “cooption” that it refused to work with establishedorganizations and rejected calls to create a focused strategy for advancing itsobjectives. The abdication of Congress during the Korean War of its role in deciding when the nation goes to war has been a major factor in subsequent US wars of imperial expansion. The Gulf of Tonkin Resolution was another example of giving away congressional war powers to the President. The Authorization for the Useof Military Force formally gave Bush almost complete authority to start wars of corporate conquest and to restrict civil liberties. That power has now devolved to Obama. To his credit, he sought congressional authorization for a directattack on Syria and may seek authorization to strike at ISIS. This does not of course excuse the fact that he continues to use the AUMF to support proxy wars in Syria as he did in Libya, commit extrajudicial executions of both foreign nationals and US citizens around the world and to extend his power to suspend civil liberties through provisions of the 2012 NDAA that gave him the power to determine Americans enemycombatants, subject to military law until the “cessation of hostilities.” The question is, if Obama truly believes that War of Terror cannot go on forever, how and when does he think it will end? Only after Americans have a basic grasp of the imperialist nature of its government and whose interests it serves will they be prepared to understand just how ruthless the puppet masters of Congress and the White House can be. It is the nature of Empires to crush all opposition, both foreign and domestic. The means to establish a permanent police state in the US are in place to respond to any organized resistance to imperialist policies, and effective antiwar organizations are closely monitored. If Americans fail to come together as part of a grassroots united international front against fascism and war, they too will become victims of the Empire in more than just the economic sense that they already are. The most effective way to challenge those who blindly accept the lies of their government is to tell them about a conspiracy to overthrow the government that is no theory, but established fact. 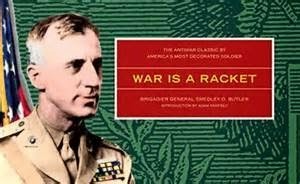 Smedley Butler was a highly decorated Marine general who testified before Congress in 1933 about an plot by wealthy industrialists to stage a military coup and overthrow Roosevelt. It was the most important event in US history that most Americans have never heard of. Congress took the testimony, videos of which are stillavailable online, but did nothing to pursue the plotters. This left them free to subvert the government is less obvious ways, and to raise their children to do the same. If this is not enough to persuade doubters that the government is and has been in the hands of corporate puppet masters for decades, nothing will. If and when America is free from their influence, it is a cautionary tale we will teach our children forever after. The next time someone calls you a “conspiracy theorist,” ask him if he has heard about Smedley Butler. Once he understand the implications of the plot Butler revealed, ask him if he knows that a third building fell on 9/11. If enough of us are willing to speak about the “unspeakable,” we can change the national conversation about what is wrong with America and what needs to be done to create a true representative democracy in the United States.